"Sample Copy Not For Sale" on white labels with "1841 Broadway" address. Front of jacket has yellow sticker "Promotional Copy Not For Sale" and black sticker which lists "Zoso", symbols, album tracks, Atlantic Recording Corporation, and address again. Album has original gray/brown flip-back cardboard inner. Some copies were distributed in a plain white cover with 'New! 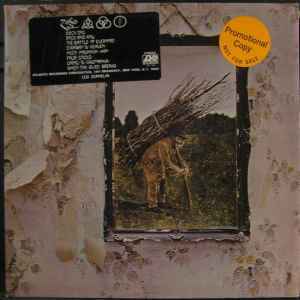 Led Zeppelin Release' rubber-stamped on it.